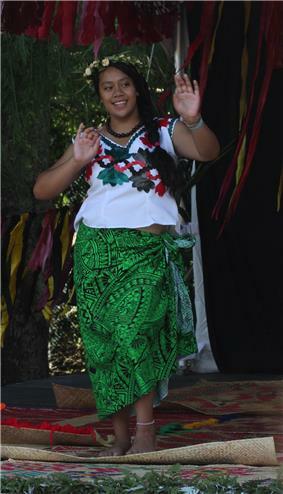 The Polynesian people consists of various ethnic groups that speak Polynesian languages, a branch of the Oceanic languages, and inhabit Polynesia. 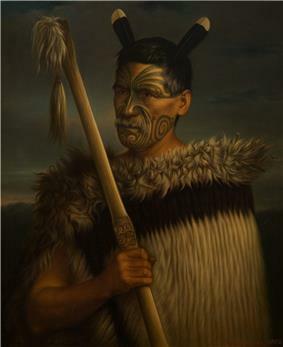 The native Polynesian people of New Zealand and Hawaii are minorities in their homelands. 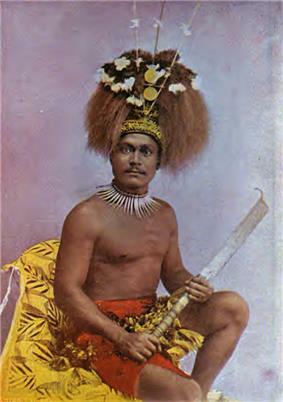 Polynesians, including Samoans, Tongans, Niueans, Cook Islands Māori, Tahitian Mā'ohi, Hawaiian Māoli, Marquesans and New Zealand Māori, are a subset of the Austronesian peoples. 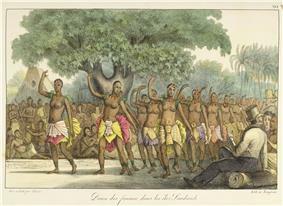 They share the same origins as the indigenous peoples of maritime Southeast Asia, Madagascar, and Taiwan. This is supported by genetic, linguistic and archaeological evidence. The most widely accepted theory is that modern Austronesians originated from migrations out of Taiwan between 3000 and 1000 BC. However, Soares et al. (2008) have argued for an older pre-Holocene Sundaland origin within Island Southeast Asia (ISEA) based on mitochondrial DNA. 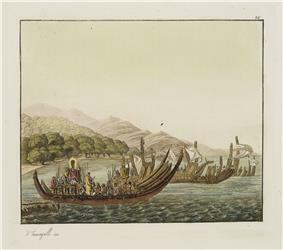 Polynesians may have arrived in the Bismarck Archipelago of Papua New Guinea at least 6,000 to 8,000 years ago, via Indonesia, and presumably left the mainland about 10,000 years ago. Paternal Y chromosome analysis by Kayser et al. 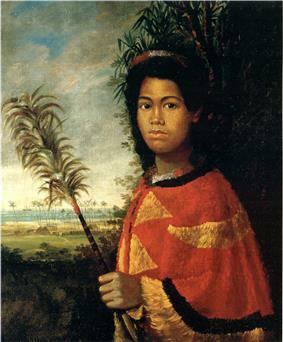 (2000) also showed that Polynesians have significant Melanesian genetic admixture. However, a follow-up study by Kayser et al. 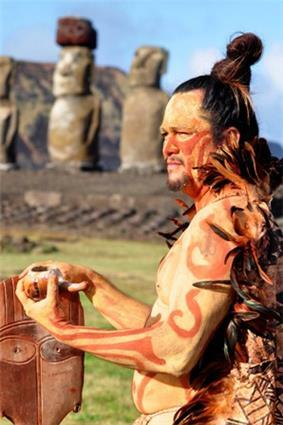 (2008) discovered that only 21% of the Polynesian autosomal gene pool is of Melanesian origin, with the rest (79%) being of East Asian origin. Another study by Friedlaender et al. (2008) also confirmed that Polynesians are closer genetically to Micronesians, Taiwanese Aborigines, and East Asians, than to Melanesians. 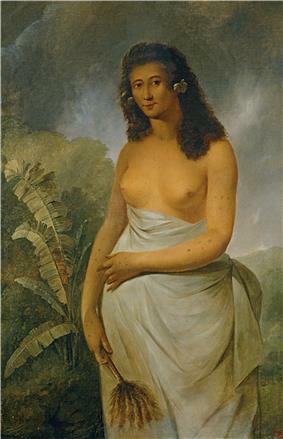 The study concluded that Polynesians moved through Melanesia fairly rapidly, allowing only limited admixture between Austronesians and Melanesians. Thus the high frequencies of B4a1a1 are the result of drift and represents the descendants of a very few successful East Asian females. 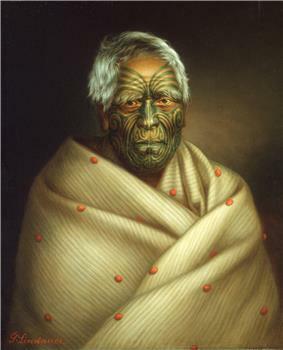 A portrait of Māori man, by Gottfried Lindauer. 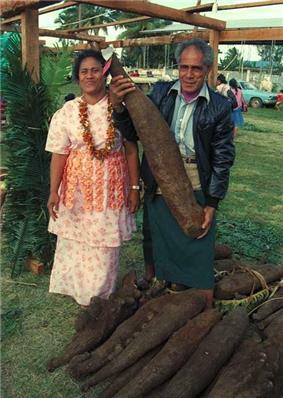 Kava ('ava) makers (aumaga) of Samoa. 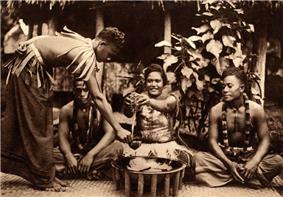 A woman seated between two men with the round tanoa (or laulau) wooden bowl in front. 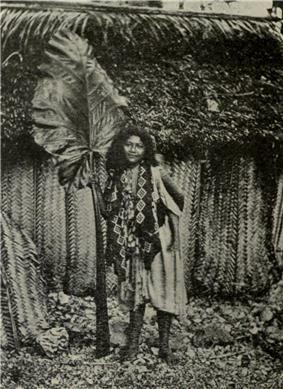 Standing is a third man, distributor of the 'ava, holding the coconut shell cup (tauau) used for distributing the beverage. ^ M. Kayser, S. Brauer, G. Weiss, P.A. Underhill, L. Roewer, W. Schiefenhövel, and M. Stoneking, "Melanesian origin of Polynesian Y chromosomes," Current Biology, vol. 10, no. 20, pages 1237-1246 (19 Oct. 2000). See also correction in: Current Biology, vol. 11, no. 2, pages 141-142 (23 Jan. 2001). ^ Friedlaender, Jonathan S., Françoise R. Friedlaender, Floyd A. Reed, Kenneth K. Kidd, Judith R. Kidd, Geoffrey K. Chambers, Rodney A. Lea et al. "The genetic structure of Pacific Islanders." PLoS genetics 4, no. 1 (2008): e19.